Multiple employees with custom working hours and days off. And many more (see feature list). Where can I see the feature list? Feature list can be found here. It’s not 100% complete, but covers all major features. Detailed documentation, tutorials, demos can be found on the plugin’s website. A demo (fake Gym website) can be found here. A back-end “sandbox” demo is coming in a few days. Is it complicated to set up and use? Not at all! Installing and configuring are trivial. Each backend page includes tooltips and has a link to related documentation pages in the bottom part. We tried to make the documentation as detailed as possible to make your onboarding experience smooth – see for yourself! 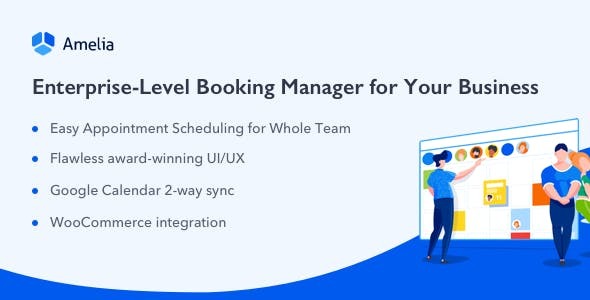 Amelia was built with the focus on what’s important to all participants of the booking process. The most important is the business owner. 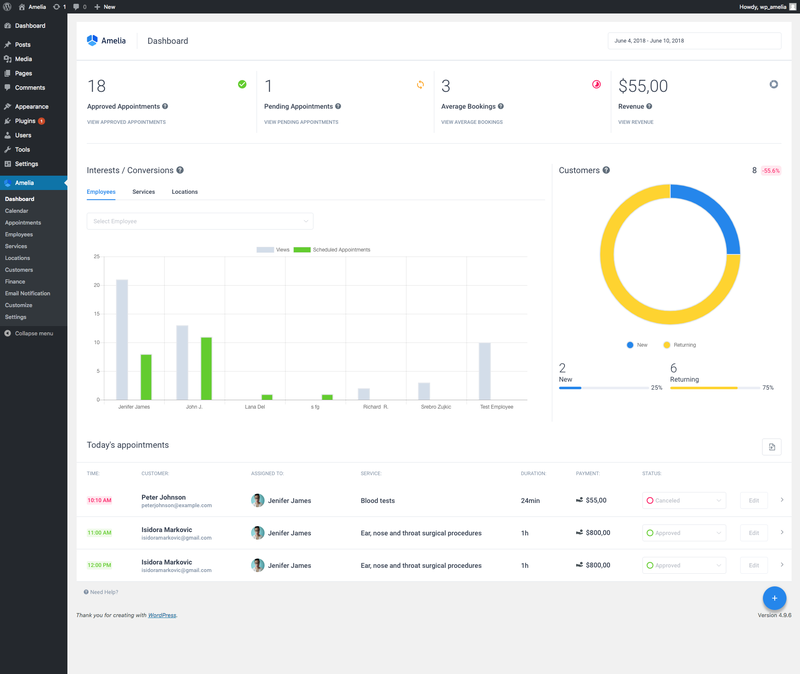 That’s why the main back-end page of the plugin is the Dashboard, which monitors all business-critical KPIs in a single one-page control panel, allowing the business owners and managers to always keep track of all vital parameters. Schedule is always best visualized on a calendar view. 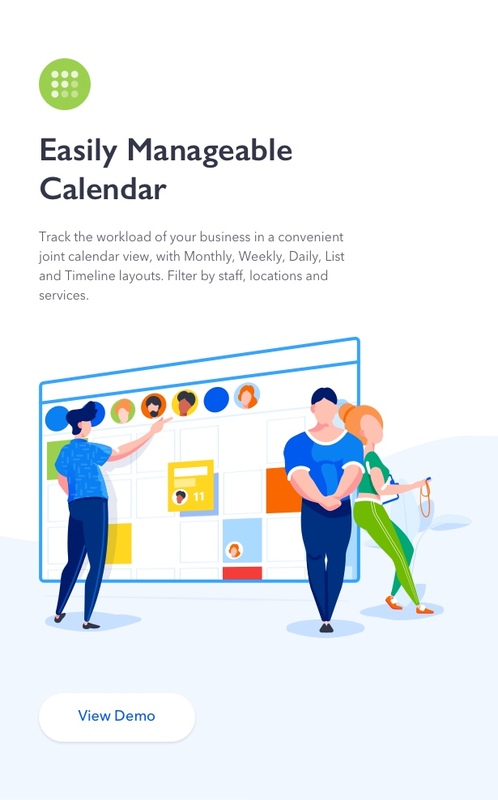 We worked hard to prepare a very flexible and detailed calendar view, that can give you any level of insight that you need – all services and all employees, or just particular ones; monthly, weekly, daily views, or more specific List and Timeline views. It doesn’t matter if your business is a one-man-show, or you have 20 employees – Amelia can support both cases. Each employee can provide a particular set of services, and had individual schedule, days off, working hours and breaks. Amelia provides a way to configure a catalog of services and categories (groups) of services – each service can have its own price, duration, allow or disallow group appointments; it is possible to configure buffer time before (time needed to prepare for an appointment) and buffer time after (time needed before same employee will be able to accept new customers, e.g. to rest or clean up). Amelia will support you as you grow your business and expand to multiple business locations. Each location can be added to the database, employees assigned to locations, and then your customers will be able to additionally choose a location while they book. We have a lot of our ideas plans for Amelia plugin – however we would love it to bring most value to the end users, so we always listen to the feedback to make it as useful as possible. If you have an idea, suggestion, or if Amelia is missing a key feature that you need – please vote for a feature or suggest your own idea here. 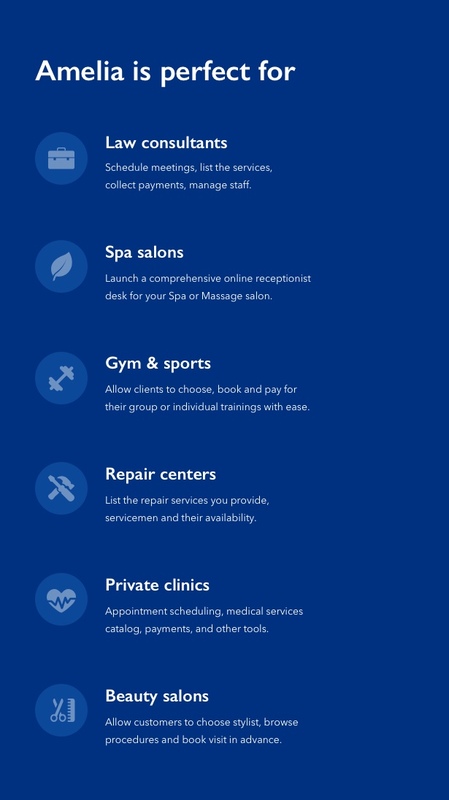 Feature: Option in General Settings to restrict customers from booking a Pending appointment. Feature: The first available date is shown in the calendar – especially good for services that happen from time to time – the customers won’t need to search for a date, instead, the month with available date will be shown right away. Feature: Event attendees are removed from customers’ events in Google Calendar. Feature: Minimum time required before booking now works only for the front-end bookings. Bugfix: Fixed issue with custom field placeholders in the canceled notifications. Bugfix: WPML multi-language site datepicker translation. Bugfix: Fixed issue with custom fields and WooCommerce. Bugfix: Fixed issue with WooCommerce price calculation. Bugfix: Duplicate appointment option on Calendar fixed. Feature: Option for employees to add/manage their own Days Off. Feature: Option for employees to edit their own Special Days. Bugfix: Fixed the issue with appointment_date_time placeholder in notifications. Bugfix: Fixed the issue with scheduled SMS notifications. Bugfix: Fixed the problem with caching. Bugfix: Fixed issue with appointment_start_time placeholder in the notifications when Time Zone option is enabled. Feature: Option to set Google Calendar event’s name for 2-way sync. Added Roles Settings on the Settings page. BugFix: Resolved conflict between Amelia, Divi and Yoast plugin. 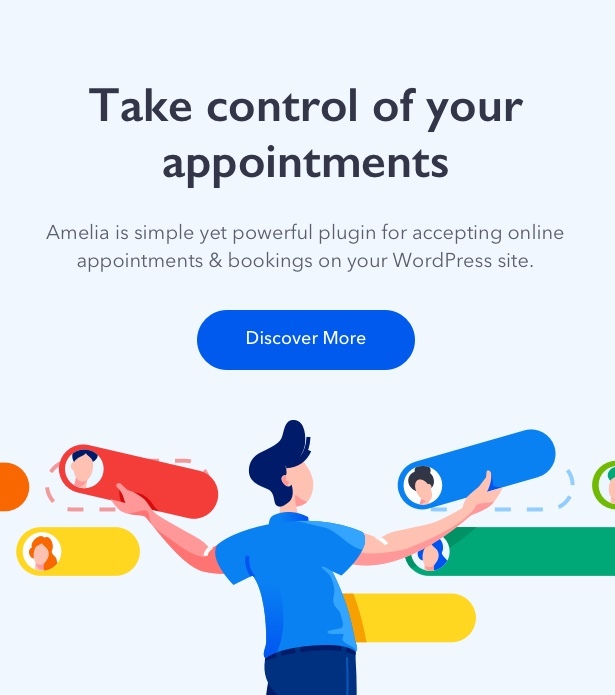 Feature: Sending of automatic email when Amelia user is created from WP dashboard – now your users get an email that allows them to set up the account faster. BugFix: Daylight Saving Time issue fixed. Feature: Custom Fields feature – now it is possible to add custom fields (checkboxes, text areas, etc.) to the booking form – now you can collect additional information from your customers about their requests. Feature: Option to use service duration for time slots on Booking form. Feature: Other small improvements like: preloader on the booking form, changed label ‘Stripe payment’ to ‘Credit card’, new view of the Booking form when there is no options for choosing. Feature: Location filter in Step-by-Step Booking Wizard. BugFix: Problem with a price calculation and payment methods when service price is 0. Feature: Option to allow employee to manage their appointments (Added in the General Settings). BugFix: Fixed “G h i min” French time format.